Two second-half goals from Lee McCulloch sealed a Rangers victory in this Glasgow derby and sent the Ibrox club to the top of the Third Division. The opener came 12 minutes after the break when the Rangers captain finished off a great run by Dean Shiels. 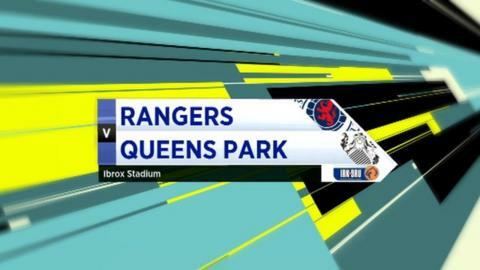 Rangers had to wait until the stroke of half-time for the decisive second. Barrie McKay's shot crashed off the crossbar and McCulloch was first to react to knock the ball into the empty net. Rangers almost took the lead after just four minutes. Shiels and McCulloch played a one-two on the edge of the Spiders' 18-yard box before the Northern Irishman fired in a shot that was well saved by Neil Parry in goal. It was far from being one way traffic, though, and Gardner Speirs' side came close to scoring what would have been a sensational opener. Gers defender Lee Wallace dithered on the ball inside his own box and was robbed by Paul Gallacher. He cut the ball back to Jamie Longworth who had plenty of time and acres of space but elected to hit the ball first time - he fired high over the crossbar. A crowd of 49,463 had packed into Ibrox and for those supporting the home team it was a long wait for the opening goal. Shiels, who had been switched to the left flank by Ally McCoist in the second period, waltzed past two visiting defenders before cutting the ball back for McCulloch who had a simple task from just two yards out. Queen's Park refused to lie down and should have been back on level terms a few moments later. Andrew Robertson found himself clean through on goal after good play involving Longworth and Keenan. The home defence looked on as Robertson looked certain to equalise but the winger delayed his effort before eventually firing straight at the legs of Rangers keeper Neil Alexander. Rangers, however, wrapped up all three points with a second goal as the full-time whistle neared. Substitute McKay tried his luck from 30 yards out and when his effort came back off the crossbar McCulloch was first to respond to fire in Rangers' second and take the Ibrox club to the top of the table.